There is nothing more nourishing for the body and the soul than a home-cooked meal with great ingredients and great company. We love cooking and because the kitchen is such a special place for us, we built two! One inside and one outside. 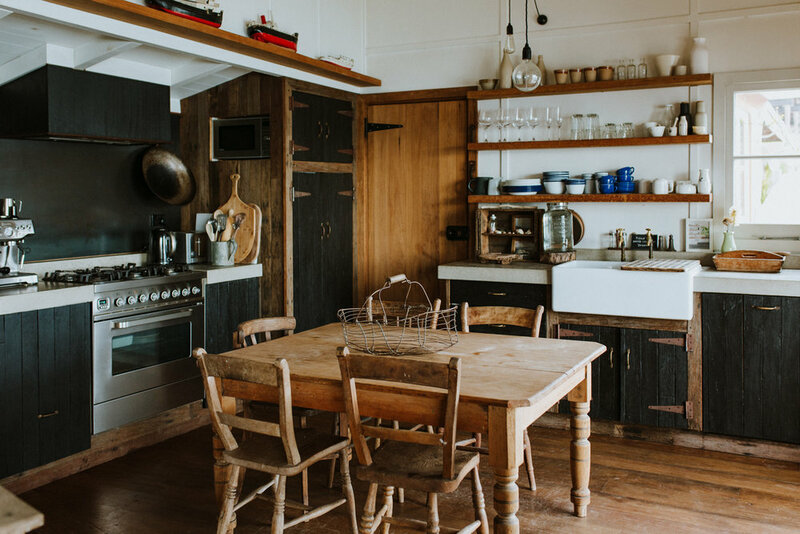 Inside, our gourmet kitchen features a large Ilve gas stove (run off LPG bottes) with an electric oven, a large french door fridge/freezer, microwave and an espresso machine not to mention all the pots, pans and utensils you could ever need, plus a dishwasher to wash them. At the shack we also have a fully stocked gourmet pantry and our own organic kitchen garden. Outside there is a rustic outdoor kitchen featuring a camp-style sandstone charcoal BBQ, a hand-built wood-fired oven, old concrete sink, preparation benches and a large rustic dining table. Sheltered from the sun and wind and blessed with an amazing view, the outdoor kitchen is the perfect place to prepare and share your meals. Help yourself and the environment - in our kitchen garden you will find (depending on the season) all the freshest organic herbs growing right in front of the kitchen: chillies, coriander, lemongrass, mint, flat leaf parsley, basil, rosemary, lemon thyme and kaffir lime leaves. There are even native indigenous Warrigal greens you can gather from the surrounding shoreline. Along with what’s in our kitchen garden and depending on the season (and your angling ability), you can also harvest the freshest seafood - fish, crabs, lobsters, squid, shellfish, sea urchins and octopus from pretty much straight out the front of the shack. We provide fishing rods, tackle, bait and crab traps for your use. In the spirit of sustainability, we only keep what we can eat fresh that day and put everything else back in the sea for tomorrow. Please note NSW law requires you to have a current recreational fishing license so please organise one before you arrive.